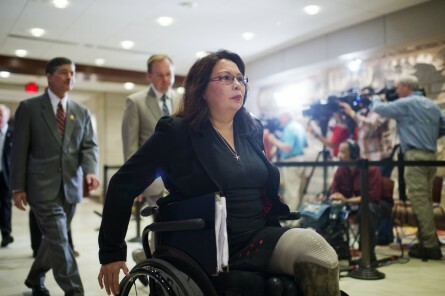 House Democrats are continuing to criticize Minority Leader Nancy Pelosi&apos;s refusal to allow Rep. Tammy Duckworth — a double amputee Iraq War veteran whose pregnancy has made her unable to travel — to vote by proxy in leadership elections this week. Pelosi and her allies have been saying since Nov. 13, when the issue first came up, that House Democratic Caucus rules prohibit proxy votes, and that allowing exceptions for the Illinois Democrat would create a slippery-slope scenario. Members and aides are privately seething over what they see as Pelosi&apos;s latest attempt to stack the deck against Rep. Frank Pallone Jr., D-N.J., who is running for ranking member on the Energy and Commerce Committee against Pelosi&apos;s closest friend and fellow Californian, Rep. Anna G. Eshoo. And many members are concerned about the optics of not allowing Duckworth a proxy vote when Democrats are supposed to be the party that fights for women. Democrats have tried to make electoral gains by touting the "When Women Succeed, America Succeeds" economic agenda. "Our party should be the party that stands up for women," Democratic National Committee Chairwoman Debbie Wasserman Schultz of Florida said in a caucus meeting Tuesday morning, according to a source in the room. A source also said that civil-rights icon and longtime Georgia Democratic Rep. John Lewis was fighting Pelosi&apos;s refusal: "We will pay a price for not doing this," he reportedly said. The Steering and Policy Committee will meet on Tuesday evening to make a recommendation for the position, with the full caucus expected to vote on the issue Wednesday morning. The Energy and Commerce race is expected to be incredibly close, where every vote will matter — and Duckworth was a public supporter of Pallone. Pelosi reiterated her decision at a news conference Monday, telling reporters: "The rules of the caucus are the same as the rules of the House. No proxy voting. ... The fact is is that it&apos;s really important to be here, to be in caucus. It&apos;s more important to vote on the floor. If I were to make a fight, I&apos;d vote to have a proxy vote on the floor than in whatever&apos;s going on in the caucus." Duckworth herself has not weighed in on the controversy, releasing an even-keeled statement on Thursday night, shortly after her request was denied. “I submitted a request to the Caucus to allow for a proxy vote due to my pregnancy. The Caucus chose not to allow me to vote via proxy. I respect the process and very much appreciated my colleagues who made sure my request was considered,” she said.